CAP Talk | General Discussion | Membership | Topic: Observations of a Cadet turned SM on Senior Membership. Observations of a Cadet turned SM on Senior Membership. I've now been to a whole FOUR Squadron meetings as a SM. SMs aren't really required to participate in much outside of the required training. I could come in to the meeting, do the opening formation (or not), and then just drop in on various unit activities throughout the night. Because SMs aren't really required to do much, or are focusing on a particular track, training, project, you may not see them there every week. Our squadron ran an Observer course that just recently ended. The weekly attendance dropped drastically on the SM side of the house. A lot of SMs wear Field and Dress Uniforms, not many of them wear them properly, or well. As a former cadet, and an HGA attendee, proper uniform wear is my thing. I've fixed some issues when I find them with cadets, but I've pretty much keep my mouth closed for the SM side of the house. Part of that is that I'll disengage again once classes start up on September 7th, and as a non-staff, "just here for the Summer" member, I don't have the authority or the place really to correct all of the issues. I'm sure some folks will jump on me for this, but I don't think it's unreasonable to expect people to wear their uniforms properly if they choose to wear them. I'll add more to this as I observe more. Re: Observations of a Cadet turned SM on Senior Membership. If I might make a suggestion (never on the cadet side...SM only). Some SMs have never really been taught about proper uniform wear, and may well welcome the opportunity to learn. Those who don't care, well, they'll continue to not care, but since they don't care, they just won't show up. That is definitely a possibility, but crashes with the observations that not all SMs are at every meeting. I think to get the majority of active SMs, I'd need to do a class 3 weeks in a row. Your input just might be very welcome. I had one of our high-speed cadets do some basic drill training for seniors. Most had either forgotten, or never knew, what to do. BTW, it was well received and formations look so much better. As to seniors not doing much as meetings, that may very well be true. Personally, I don’t get anything accomplished on meeting nights. It’s usually answering questions and helping everyone else get stuff completed. It’s the nights spent at home, which no one sees, where any real work gets done. Just because you don’t witness something, don’t assume it’s not happening. EMT, not saying SMs don't do ANYTHING, just saying that the activity on the cadet side and the SM side is quite different. I'm quite aware that (especially staff officers) do a lot outside of meeting time. It's just a bit of a different dynamic. Sorry, wasn’t a criticism, just an observation. I guess that I buried my main point, that the opinion and experience of a new-to-the dark-side member might be more welcome than you would think. Well...welcome to the gray side! We had the same issue in our squadron and what I try to do along with our DCC is take time to explain customs and courtesies as well as uniform regulations to new senior members. Granted we were actually asked to come in and speak about it on occasion because once again I as well as others noticed the same thing where SMs were not wearing the uniform properly. I actually think it is part of Level I to know and understand the uniform and how to wear it. The uniform was given to us by the Air Force and I feel that we should not have SMs who disregard the regulations. I was actually told by an active duty O-5 that correcting someone on uniform wear is a good thing because you are being a "wingman" for the individual so I say go for it and correct what you see wrong. Been here for (almost) a year! 17 Aug 10 was my official SM transfer. Didn't get to participate until this summer. There was always that issue of having a job, a wife and three kids who were all competing for my time when it came to attending meetings every week. CAP landed at the bottom. If there were times that I needed to be there several weeks in a row other things tended to suffer. The Senior program doesnt require them to attend every week. Generally, one night per month is pretty adequate for a Senior for a standard meeting. However, I do see a definite need to wear the uniform properly. I find in my experience most seniors do not have a background with wearing military style uniforms and often equate it to any other uniform they may have worn at a job. Where I think people go wrong with teaching uniform wear is that they tend to approach it with "The cadets are looking up to you." I would avoid that avenue because many may not care if Cadet Jones is looking to see if his creases are sharp. Approach it from the angle of why they need to from a military/USAF requirement angle. But dont get yourself in trouble by comparing the senior participation to the level of cadet participation. Two completely different programs with different requirements. Like EMT posted, CAP doesnt just happen. I was the same way, meeting nights were pretty routine. It was all of the other HOURS of work spent away from the base that got CAP done. Dealing with personnel issues, building issues, meetings with the Grp Commander once per month. Cadets never see a lot of what happens. They think because Capt Smith didnt show up in uniform he is a slacker. They dont know that he spent all day at the DMV trying to get the Sq van registered and smogged or spent all day at a city office trying to renew the lease for building so you all dont get kicked out. Or, that he/she had a disastrous day at work and would really rather be at home but came anyway. I always told my members, life comes first. CAP doesnt pay the bills. Keep that in mind before we start ripping them for not having HG level uniforms. There were many times that I didnt have $30 for a new blues shirt, and when I did, it went to getting my son something he needed for his. Not excuses, but there is a reality of life people cant appreciate when they are still living with mom and dad. But none of that is an excuse for not know when, where and who to salute. enough to really get into the nitt-gritty, but they all want to get it right. Eclipse, you obviously would know, since we're in the same Group. Flying Pig, I wasn't so much passing judgement, as simply noting a difference - something I didn't really pay attention to as a C/Officer who interacted with SMs quite regularly. I didn't get to a CAP meeting this summer until July, because life got in the way for 3 weeks straight. Then there was another week when I had to miss after finally making it out to the unit. Today I have to miss a great event because I have my Stats class at the same time tonight. I get that life happens. I get that bills need to be paid - I've been paying my own since moving out, 35 months ago at 18 1/2 years old. I also get that probably for most of the members with issues, they want to get it right but just don't know, or think they got right, but really didn't. Fixing blues/greys is easy. I could even do it for them, and write out instructions. Fixing a BDU/BBDU is much harder unless the member does it himself (or that is the root of the issue). The most common issue I've seen involved droopy nameplate on blues (no reinforcers), perhaps misaligned nameplate at the same time. 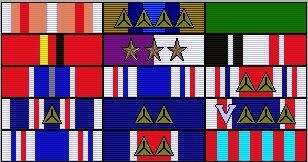 If ribbons are worn, then the placement/ribbon rack style/ribbon order may be the source of the problem. I've seen SM (WOG) wear the No-grade slides on their blues shirt, with the "CAP" metal cutouts on the collar. However this was at an event with Region, Wing, Group and Squadron commanders present, and my literal first outing as a SM, and the member who had the issue, I wasn't about to correct right then and there. I'm not going to even focus on the shapers for the slides or gig lines. As long as they wear the slides right, and the overall wear looks passable, that would be a good start. When it comes to B/BDUs, it gets a bit harder to correct issues. Sometimes members sew on their own nametapes - it shows. Not everyone is as skilled as my grandmother, and even for all of her advice, I'm decent at best. Sometimes the member will take the blouse to be done by a seamstress, but don't relay the correct dimensions, or get the work screwed up. How do you turn to anyone, and say "I know you paid about $3.00 for each item to be sewn on, but your US Flag is sitting too low, your Wing patch is as well, and since it is optional, you can just take it off, your nametape is spaced way too far above the pocket, your ground team badge is too close/far from the 1/2" dimension specified, oh and by the way, it's 1/8" blue field, not 1/4", the captain bars are not 1" from the collar, and are a bit crooked". First, that's way too much information for someone who just wants to do ES work, and is a rocking GTM or Pilot. Second, just to fix the hypothetical issues at $3 an item, that comes out to $15 for the 5 items on top of the original work, and wasted $3 for a misplaced wing patch. Who wants to talk about blousing boots with some SMs? Where does one draw the line between "getting the job done", and "looking the part" (at least to the minimum standard). Your question cannot be answered. If they are that "rocking" and still have issues like those, especially on the same shirt, they are either too new to be "rocking" anything, their attention to detail is lacking, or they have decided that somethings can just be thrown together because they "don't matter". And / or their commander is blind. Any way around it needs to be fixed. What's the big deal? Show them how. (Though it is not required on the blue field uniform, it's a good idea). As I am sure you recall, we thought important enough to issue blousers to everyone at encampment and they were all supposed to be shown how to use them. (And they weren't for holding your towels on your belt or your radio mic on, though they work good for that as well). There's no line, it's all part of the same conversation. The only thing that chaps me more than getting something wrong, is walking around all day, surrounded by people who I know saw it, and them not respecting me enough to tell me, instead content to see me walk by looking like a goof. I much prefer to be told about the mistake so I can fix it. Having been through this confusion myself (and still experiencing it with some things), I completely agree with Eclipse. New SM's want to be a part of the organization as much as cadets do, even if they are different programs. Wearing the uniform correctly is a huge part of feeling part of the team, and someone correcting me on my uniform shows me that they care. It doesn't matter if it's patch placement, or blousing, or whatever. The details are important, and I would never be upset with someone for pointing them out. I had this long thing going again, and then I deleted it. Say I discuss the idea of a uniform class for the SMs, maybe having them bring in their uniforms and inspecting/helping/giving them notes for correction. What if some still blow it off? That was never an issue on the cadet side because it's expected that it gets done. But what about the Senior side of the house? We talk a lot about motivating and moving a volunteer force, but how do you deal with folks who DO participate, but just really don't think the uniforms are a big enough deal to wear right? You can't explain them away as useless, because I've met plenty of folks who don't see the military side of CAP as something we should care about anyway. Does the Commander then have a conversation and if needed tell them to stick to the Polo? How do you manage this hypothetical situation? How do you manage this hypothetical situation? Unless you are a Commander, or otherwise in a position of authority / responsibility for them, there's no situation to manage. unless I have a responsibility beyond my respect for a fellow member, there is no further avenue. Like I said, if you're comfortable, speak to them directly (discreetly and professionally), if not, mention it to their commander, or send them a "thought you should know" email after the activity. Beyond that, their reaction will speak volumes about whether you want that person involved in anything you later have a say in. While it's always good to get a "Wow, thanks, didn't realize my uniform was that bad," in the cases that you don't, this is the best bit of advice I've ever seen. I think uniform wise, many senior members wear golf shirt combo. The rest of the uniform types available can cause some wear issues for a limited number of senior members. Frankly, it's up to the Commander and/or Deputy Commander for Seniors (and maybe the Professional development officer) to be the guiding light when adults are astray in their uniform wear (although, I've on occasion correct someone IF it would really make them look too stupid). Not sure a new senior member is the person to be doing those corrections -- why cause an issue for yourself and as you said your contribution are going to be VERY limited because you are off to school anyways. As far as senior members working at meetings, it really depends what one has to do IF it involves training others that are attending the meeting to get trained, BUT generally much of the staff work is done at home on non meeting nights. Also I may get material from other members (e.g. digital photographs) that they either download into one of the squadron computers and then I use my thumb drive, or other information (cause sometimes the pictures are so large the email server rejects it). I personally don't see a young adult member having much impact on the older adults. Wow. I've seen some pretty negative things posted by you, RM. I can even see your (twisted) logic in most of the things you post. But this? That's ridiculous. You must have a disgustingly close-minded attitude around yourself and the units you're in. In my squadrons joint effort is the name of the game- members working side by side and helping each other out regardless of age. And yes, on the same topics in this thread. It's because he projects his own issues. He's always harping on "wannabees" yet what he states as his actions smack much stronger of wannabeeism than anything he complains about. He complains about secret police like IGs and yet he is always "undercover" at CAP activities. He is either a professional troll or he has mental issues. If you're going to contribute as a senior, the challenge of your first year or two is to listen and learn and transition to the adult side of the missions and the organization. Criticism about uniforms, no matter how well meaning or tactful, signal that instead of broadening your perspectives you are instead keeping to what you know as a recent cadet: uniform stuff. Trust me, if you start up with uniform minutia, people will conclude you have a lot more growing up to do, fair or not. But welcome to the fun side of CAP. I think uniform wise, many senior members wear golf shirt combo. And many more do not. (cause sometimes the pictures are so large the email server rejects it). rejects them based on size in 2011. It takes a well-crafted sentence to insult and demean that many people, an organization as a whole, and yourself with only one period. One of the most important things I've learned since I started working with Senior Members (and other adults involved in youth development) is that Maslow's Hierarchy applies to adults just as much as it does to cadets. The needs are the same, even though they might be fulfilled in slightly different ways. Once I realized this, my interactions with SMs as a cadet made a lot more sense. The SMs who frustrated me by being too involved and stepping on my toes were, in many cases, trying to figure out where they fit in to meet their Belonging needs. When I was struggling to develop my communication skills and allowed my enthusiasm to get the best of me, it sometimes threatened their Esteem needs, which instinctively triggered defense mechanisms. Simple human nature. As a cadet, it's really easy to forget that Senior Members are humans, too. As a new Senior Member (and with my college-induced sabbatical, I still consider myself to be a relatively new CP Officer), it's easy to unintentionally maintain that mindset. I'm still working on figuring this stuff out, too. My guess (and my hope) is that I will continue learning more and improving my skills in working with Senior Members and cadets alike as long as I'm in CAP. Regardless of how old I happen to be at any given moment. I have an issue with my provider, and it's just easier to have them download it or even burn a CD. I've had up to 300 pictures from one activity to go through to pick one for a press release. Also in any press releases to national one has to cut them down anyways. Simple solution to a simple problem. Don't wear the AF style uniform until you have all the necessary parts to wear it. Aviators getting dirty? There's this magical invention called a washing machine. If you're getting a white shirt dirty, then you should find a different uniform more amenable to the conditions. We keep feeding the troll called RM why?? Cripesallbloodymighty, RM, do you have to "bolster" your personal agenda of a non-uniformed CAP (yes, I know, we're the CIVIL Air Patrol, ya sure, ya betcha, tie me kangaroo down sport) with a putdown of a young officer who is trying to make a difference, especially in the realm of esprit de corps? About the only time anyone in my unit wears the golf shirt is when it's too hot to wear any other uniform (full disclosure: I don't even own a golf shirt). Otherwise it's blues or G/W - and they are usually clean and pressed. Of course, we have a good chunk of PS members (from all five services). I can tell you that I would listen...in fact, cadets have tactfully, and within the realms of protocol addressing an officer, have told me when I've been errant with my uniform. I don't resent it. I encourage it. I'm in a squadron that has turned out many Mitchells (and above), most of whom have gone on to military service. I was in a squadron that produced a Spaatz, and she was an exceptional young woman to say the least. I was a lieutenant at the time and she went SM for a while before going to university, which made her a Captain, which meant that I had to listen to what she had to say...not to mention salute her. What Captain Briski said about Maslow's Hierarchy is very true...I hadn't thought of it in relation to CAP. Well, knowing that my CC reads CT, and after this went from general observations to uniform specifics, the plan is to have an inspection next meeting for the SM side of the house. Thankfully, the SM who fixed a ribbon mixup on my uniform is also going to be involved. As a fellow former cadet turned senior I also notice that most of my seniors don't know what they need to do to get beyond level II or Tech in their specialty track. This bothers me because within in my 18 months or requited time in grade, I am not only going to become one of two Captains and the only one with Level III completed I have taken it upon my self to get all of the 1st LT's that have been in that rank since I transferred to the squadron in Sept 2007 as a cadet and get them set up to be Level III Captains before I leave for basic training. Sounds like you should be looking to add Professional Development Officer to your signature line. I enjoyed my time in the PD track. Being a former C/Officer definitely helps with looking up regs and requirements, but thankfully that's not one of the issues I've noticed at our unit. If anything, there USED to be a lot of Captains, but a large number have now become Majors. I'm not going to get into the whole uniform corrections thing. The seniors will be watching very closely to see how you interact with the cadets, and the cadets will be watching very closely to see how you interact with the other seniors and them. How you navigate this will be your biggest test. I left active participation August 2008. There is ONE cadet who was around when I was a C/Capt. Since coming back, they have ONLY seen me as a Grey/Whites or BBDU. I demand customs and courtesies be followed, and I'm only around the cadets when following what the CP SMs are doing. The only issue for me is that I can't bring myself to calling other SMs by first name. If it's a Capt and up, it is "Sir", if it is a Lt, then it's Lt. But I don't really think that's an issue. There is nothing wrong with doing the more formal thing around cadets. It probably should be encouraged. Keep calling Bob, Sam, or John by first name in private. And there is nothing right about using first names around cadets. I have continual problems with the instructor team I'm part of when we do ROA classes having cadet students. The reason I brought it up was because that was advice I received on the board not too long ago, and I think it just wasn't that great. If the SMs are doing it, maybe it's just time someone started to do the right thing. Aviators getting dirty? There's this magical invention called a washing machine. That just made my night . Actually sir once I get back from basic training, I'll be adding that and Deputy Commander for Seniors as well. You're going to need a bigger monitor for that graphic. Any particular reason you need to have that many jobs? It may be that his squadron needs that much help. My squadron had most of the seniors with 3 to 4 jobs just so we could function. We buckled down on recruiting, now it's not a problem. I will agree that to many jobs on one person is not good. No matter how talented, go-getter, can-do, etc. you are, unnecessary stress and a slow down of quality will result. I'm not saying you cant do it, I'm just saying its a lot. I'm in the AZ Guard, with RSP Drill Weekends and CAP, of which I was Deputy Commander of Seniors, Safety Officer, Transportation, and Assistant Supply Officer, I was pretty busy. I no longer have those positions because I am getting ready to leave for BCT, and we finally have more seniors!!!!!. As far as you in the Guard, that's awesome, whats your MOS?. I was told that I had to report back here by my Squadron Commander after doing a SM open ranks inspection. I believe there was a total of 18 SMs in the formation. The most common mistake was the gig-line. The major "eye sore" mistakes typically get pounced on before a member has enough time wear the uniform that way twice. If the only thing standing out is gig-line on 18 seniors, you're doing pretty good. Full disclosure: A good percentage were newer members, thus wore the Polo combo. Bob: their zippers were probably crooked!!!! because im good at being an AEO, and no one else in my squadron knows how to navigate the underworld of senior member PD. I am also the testing officer, leadership officer, and Operations officer. What are they doing while you will be gone? No one else there interested in cracking a reg or asking questions? It's not supposed to be an "Army of One". ... no one else in my squadron knows how to navigate the underworld of senior member PD. ?? PD is pretty simple - even I can figure it out. I'm glad that you see the differences. Don't let these differences, however, cloud your thought process and make it seem that cadets are better trained than senior members. It's just that the focus is a lot different. If uniform issues are the major sticking point, my suggestion for you is that you advise your commander and than set about to change the behavior by taking each senior member aside and advising them of their error. Those are small but significant issues that are doors of opportunity into other concerns. If you haven't found out already, you're about to see that the senior member side of things is more about balancing the needs of the organization with personal and professional lives. Years ago, I transitioned from cadet to senior member, but back when there was an enlisted program. I found myself being the young guy with all the energy correcting uniform issues, personnel records, administration issues, and an assortment of other things. I was in college, too. You have a golden opportunity to make an major impact on your unit. Good Luck! We've done two ORIs now. The results were pretty good, with formations of at least 16+ SMs in each.. For whatever (numerous) reasons, I'm known as a uniform stickler. I don't expect people to sew in creases (I don't do this either). Or Starch their uniforms into stone figurines of glory (I don't do this either). But I will let someone know discretely if their laces are sticking out, if their gig line is off, if their ribbons are off, etc. It's the small things that add up to proper wear and uniformity. Anything on top is extra, and usually, as you said, outside the time parameters professionals have when working a 9 to 5 and volunteering for CAP. I've been to SIX meetings now, and have only two left until night classes steal me away for the (final) year. After that I hope to move back to the unit area, get transportation, and re-engage. Cadet Programs are obviously an interest. Public Affairs always interested me, so I may pursue that while unable to participate at the meetings even. ES (just got UDF Trainee signed off again) for the most part will have to wait a year until trying to get my GTM back to active status. I was worried initially, about what I'm going to do as a SM. Cadet Programs made sense, but typically even the CP Officers are doing other jobs at the unit. I think now I've figured out that there's plenty of opportunities, and will look forward to getting into the thick of it. As a side note, already down 9lbs since late July/early August, so 28 more lbs, and I may put my BDUs/Blues back on. Same set I wore as a cadet. Your level uniform scrutiny doesn't seem overboard to me. You're right, however, that it's the small stuff that counts. You start with the small stuff and the big stuff is already partially corrected. It also seems that your unit is progressing along the right track. As far as cadet programs. It's a good choice, because it's still fresh in your memory. Expect to be groomed for a deputy commander of cadets at some point in the future, because a lot of senior members don't have that experience. As far as PAO or other emergency services ratings: During my career as a senior member, I started initially in communicaations. It was a good fit because I had a third class radio telephone license at the time (it was how I was promoted to second lieutenant). But over my career, I've broadened out to hold masters ratings in Cadet Programs, AE and Public Affairs (my college degrees and professional experience) and a senior rating as a historian. You will find that you pursue something else over a period of time not only because of burn-out, but because of need. There is always a need somewhere. You will also find that it broadens your experience if you ever chose to take a command slot. It's also always important to pursue an ES rating. These days, with the emphasis on homeland security and disaster response, there's always a place for people to do something at a mission base. Ground Team is ok, just not my favorite because I was in security forces in the Air Force -- I had enough time living in tents or in the field. However, its a great place for cadets to give them a sense of responsibility and pride of accomplishment. Weighted myself today, so 10lbs down, 27 more to go. At this rate, I should be able to wear blues to the end of the year banquet. We'll see. I just need to get through another year of CAPTalk instead of participation, and then things should be better.